Tony Patterson at the British newspaper the Independent offers a piece on the Italian gangsters operating in Switzerland. The scene could have been lifted straight from The Godfather. In a dimly lit restaurant back room, 14 thickset men sit huddled around a table listening attentively to their boss as he lectures them on the importance of dignity, honour, respect – and extortion. Yet the sinister meeting is not from Hollywood. It is real life – a gathering of the Calabrian ’Ndrangheta gun and drugs Mafia held recently in the small Swiss town of Frauenfeld, north of Zurich. 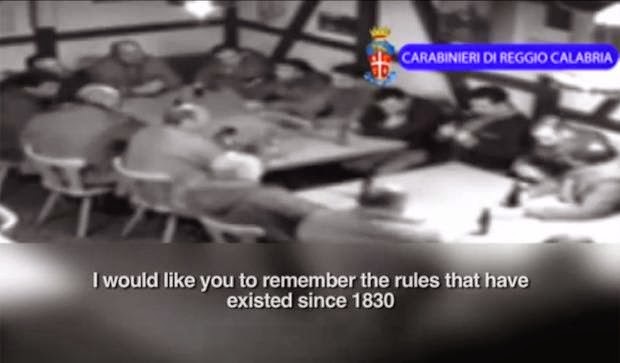 The event was clandestinely filmed by Swiss and Italian police during a two-year investigation.